Theo Joann Clark, age 73, of Alliance, passed away at 12:25 a.m., Sunday, November 18, 2018, at McCrea Manor. She was born May 27, 1945, in Alliance, Ohio, to Frank and Ruth (Price) Harbin. A 1963 graduate of Alliance High School, Theo was employed by General Motors until her retirement. Theo was a member of the Tabernacle Baptist Church and loved taking care of her home and raising her family. She also enjoyed working in her flower gardens and doing crafts. 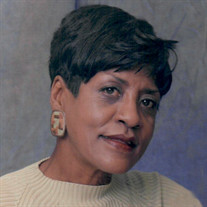 Survivors include her husband, Donald R. Clark, whom she married September 4, 1998; two sons, Michael (Brenda) Holmes of Atlanta, Georgia and James Shepherd of Alliance; daughter, Monique Shepherd of Canton; four stepsons, Layton (Pricella) Shepherd of Youngstown, Thomas James (Carie) Shepherd of Roseville, California, and Reginald Clark and Jordan Lewis, both of Atlanta, Georgia; step-daughters, Celeste (Eric) Jones of Suffolk, Virginia and Theresa (Michael) Robinson of Cleveland, and Le'Donya Clark and Darrielle Clark, both of Atlanta, Georgia; many grandchildren; several great-grandchildren; brother, Frank Harbin and sister, Cathy Harbin, both of Alliance; her 1st husband, Reggie Holmes; a special friend, Penny Jackson; and many nieces and nephews. She was preceded in death by her parents; two sisters; and her 2nd husband, James Shepherd. Services will be held at 1 p.m., Monday, November 26, 2018, at Cassaday-Turkle-Christian Funeral Home co-officiated by Pastor Aaron Hill and Pastor Bobby Williams. Friends may call from 11 a.m.-1 p.m. prior to the service.